Have you heard of Instagram? I’m kidding. Of course you’ve heard of Instagram! Have you heard of Jenny Evans’ hilarious blog Unremarkable Files? If you answered yes to both of those questions, then you’re in for a treat. If you answered yes to one, but no to the other, then you’re still in for a treat. If you’re my mom and you answered no to both questions above, you can still have the treat. That’s because I’m over on Jenny’s funny blog today sharing the 5 Instagram posts you won’t see from me. She’s letting me highjack, er, post on her blog because she’s off enjoying time with her newborn baby, her sixth. You go girl. So check out my post now and feel free to leave some comment love here or there. If you’re on Instagram, leave your handle in the comments so I can follow. I’d love it if you follow me on Instagram, too! 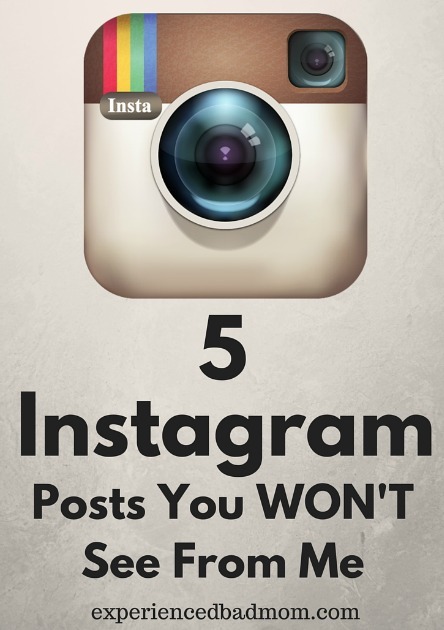 Are there any of these Instagram posts you won’t see from me that I will see from you? Hee hee! I didn’t realize a diaper wearin’ toddler smashing a snack in his face while in the car seat hits 3 of my criteria! You’re brilliant (of course). I won’t ever do naked pictures. And I rarely take photos of myself. I feel weird doing that. But I will take pictures of food. I love food. I love food, too! But I’m much better at eating it than photographing it.